Cardinal Joseph Ratzinger, well-known Vatican prelate and head of the Congregation on the Doctrine of the Faith, gives a full-length interview to a secular journalist on a host of controversial and difficult issues facing Catholicism and Christianity at the end of the millennium. Similar to his best-selling book interview in 1985, The Ratzinger Report, he responds with candor and insight, giving answers that are often surprising and always thought-provoking on a series of wide-ranging topics regarding the present and future state of Christianity. Ratzinger begins by discussing his own life, including his family life, being a theology professor and writer, becoming a Bishop, Cardinal and the Pope's top authority on doctrine. He then discusses the problems of the Catholic Church today and talks about the challenges and hopes of the future of Church and the world at the beginning of the Third Millennium. Originally a liberal theologian, he adopted conservative views after 1968. His prolific writings defend traditional Catholic doctrine and values. During his papacy, Benedict XVI advocated a return to fundamental Christian values to counter the increased secularisation of many Western countries. He views relativism's denial of objective truth, and the denial of moral truths in particular, as the central problem of the 21st century. He taught the importance of both the Catholic Church and an understanding of God's redemptive love. Pope Benedict also revived a number of traditions, including elevating the Tridentine Mass to a more prominent position. He strengthened the relationship between the Catholic Church and art, promoted the use of Latin, and reintroduced traditional papal garments, for which reason he was called "the pope of aesthetics". 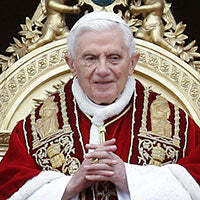 He has been described as "the main intellectual force in the Church" since the mid-1980s.